Steve Briggs, from Eagan, Minnesota, is a postcard collector with a special interest in Clearwater Lake in Minnesota. He has generously contributed fifty cards to the “Shared Photos” section of this website. Most are associated with early resorts, and many are over 100 years old. Click here to view these postcards, or play the video slide show below. 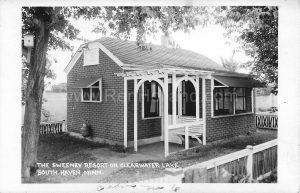 Most resorts on Clearwater Lake have vanished. Two of the brothers and their families have been taking annual fishing trips to Clearwater Lake for the past 6 years. They have rented from the Maple Hill Resort and from private cabin owners. My thanks to Steve for sharing his collection for all of us to enjoy.